Translucent curvacious ballpoint pen with rubber comfort grip and shiny silver accents; Caribbean blue with Hampton Inn or Hampton Inn & Suites logo. Backrest bar with straps supports even the heaviest luggage and gives your walls the greatest protection. Strong metal construction with 1" tubular steel frame; 9-1/2" backrest bar. Sturdy, washable black poly straps and plastic feet. Don't mistake with low-quality imports. Made in U.S.A. 6 pcs. per case. R-Tek stretch fleece beanie cap is available in a variety of colors to match your corporate uniform (please choose below). Available with your corporate logo or with no logo (please choose below). Minimum: 1. SuperScrape™ 100% black rubber entrance mat, 3' x 5', is designed for high-traffic outdoor areas. Pressure-clean it with confidence, the Fairfield Inn or Fairfield Inn & Suites logo is permanent and will not fade. Slip-resistant for ultimate safety - these mats have excellent durability and traction properties, rubber safety borders. Effectively removes tough dirt, grime, and water from shoes. Resistant to oils and chemicals and will not fade. Also available with all other Marriott logos, as well as in plain black. Custom colors and sizes no problem - please contact us. Minimum order: 1 mat. SuperScrape™ 100% black rubber entrance mat, 3' x 5', is designed for high-traffic outdoor areas. Pressure-clean it with confidence, the Courtyard by Marriott logo is permanent and will not fade. Slip-resistant for ultimate safety - these mats have excellent durability and traction properties, rubber safety borders. Effectively removes tough dirt, grime and water from shoes. Resistant to oils and chemicals and will not fade. Also available with all other Marriott logos, as well as in plain black. Custom colors and sizes no problem - please contact us. Minimum order: 1 mat. Jerdon's lighted table top mirrors are made at the highest quality with a touch of elegance and class. The 5X magnifying mirror has a height of 15" with an 8.5" diameter mirror and a nickel coated finish. Price is per case, 2 pcs. per case. Please view quantity discounts by clicking on blue discount button Plain white paper waste can liner to fit WESCON/Lancaster Colony 13-quart oval plastic waste can 09-7600 and 09-7650. 9" x 6-1/4" oval. 2,000 pcs. per case. This item can be customized with your hotel's logo (please note Product Code 1032054C). SuperScrape™100% black rubber entrance mat, 6' x 8', is designed for high-traffic outdoor areas. Pressure-clean it with confidence, the 3-color Courtyard logo is permanent and will not fade. Slip-resistant for ultimate safety - these mats have excellent durability and traction properties, rubber safety borders. Effectively removes tough dirt, grime and water from shoes. Resistant to oils and chemicals and will not fade. Also available with all other Marriott logos, as well as in plain black. Custom colors and sizes no problem - please contact us. Minimum order: 1 mat. FashnPoint ® white guest towels are soft and absorbent (a medium between paper and linen-like material). The unique EZFold allows users to easily pick up one towel at a time. 11.5” x 15.5”, 1/6-fold in dispensing box. Price is per case of 600 pcs. 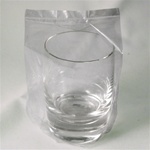 Use it as a table center piece or for water service. Heavy quality piece, easy to clean. Minimum: 1. Glaro RecyclePro "Profile" half round 10-gallon recycling receptacles come in a beautiful 30" x 18"x 9" designer color finish. Choose from 29 elegant designer color finishes as well as 5 different recycling covers (please choose below). Finely crafted in the U.S.A. by Glaro, these durable, all metal, fire-safe units feature a full width piano hinged cover and rustproof aluminum bottoms and are great indoor/outdoor, low profile, space saving recycling receptacles. Fairfield Inn by Marriott 16-ounce candy jar, No. 1223720C House brand ironing board, No. 029-EB5313- case of 4 pcs. Fairfield Inn/Fairfield Inn & Suites 16-ounce glass candy jar with lid - add the ouch of home to your rooms and front desk with this classic candy jar. Easy to fill with bulk candy. 4" w x 5 1/2" h.
Please add a one-time $55.00 screen charge (per color). Our house brand ironing board its lighter weight and more affordable. Infinite height adjustment up to any level in a 35” range for comfortable ironing. Full-size perforated top measures 13” w x 53” l; 1-1/8” T-legs add strength and stability. Men's and ladies' styles in both short and long sleeves with button-down collar and patch pocket. Our wrinkle-resistant shirts made by Port Authority™ are a cut above the competition. This comfortable, wash and wear shirt is indispensable for the workday. 4.5-ounce, 55/45 cotton/poly blend. Dyed-to-match buttons, box back pleat and adjustable cuffs on long sleeve styles. Impressively embroidered with your corporate logo. Available in green, white and stone. Priced here for short sleeves and sizes XS-XL (please call us for prices for sizes 2XL-6XL). Minimum: 1 shirt.